The Grand Lodge is a 4,000 sq. 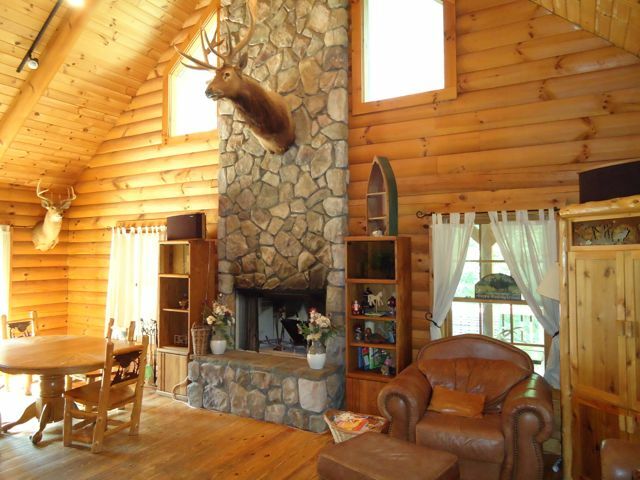 foot log lodge with one ground-level King Suite with master bath, 2 upstairs Queen Suites with private baths and connecting baths, 1 lower-level Queen Room with access to hall bath, 1 upstairs Queen Open Loft, and a Bunk Room with 5 singles. Additional single bed located in one of the Queen Suites. 4.5 total baths inside the Grand Lodge. 3 full size sofas. 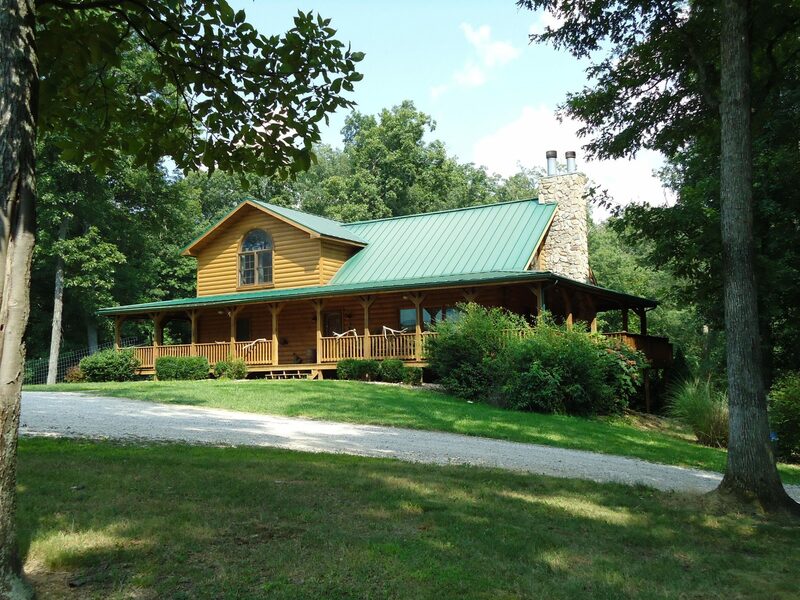 Click Here to See a Floorplan! 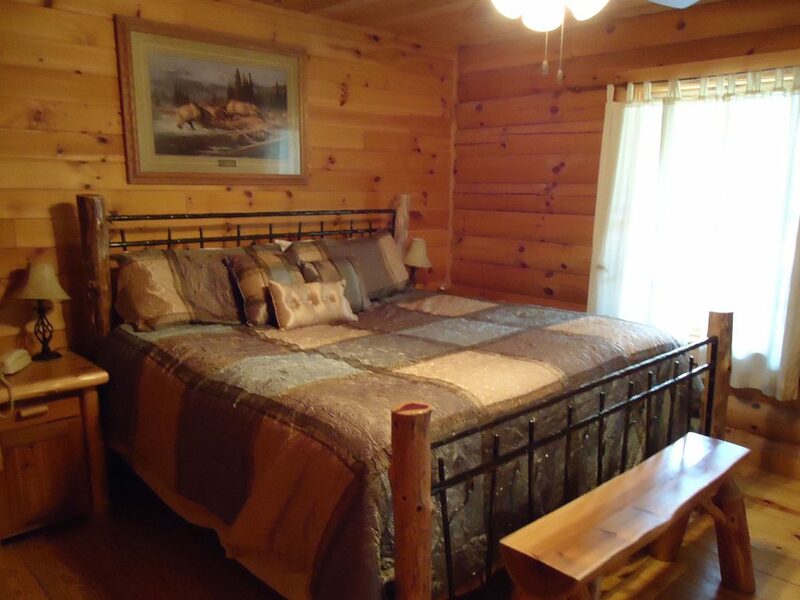 Moose Room – The Moose Room is a Queen Suite with a private bath. View overlooking the elk pen and archery deck. Bear Room – The Bear Room has a private bath and a HD plasma TV with a sofa lounge area. Ideal for kids and video gamers. Dish satellite TV and DSL. 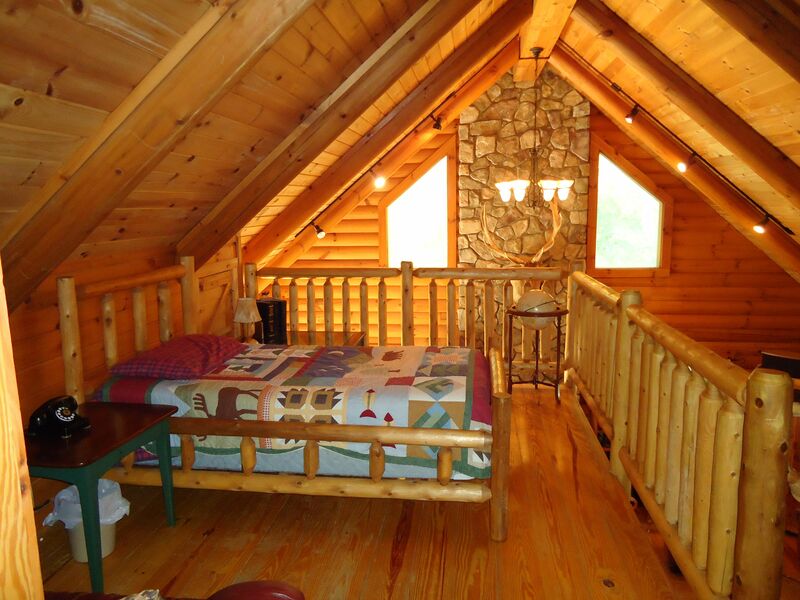 Bunk Room – The Bunk Room is a lower-level living room for kids or overflow guests. It has 5 individual beds, two bunk beds plus one twin bed, and a private bath with hall access. There is also a separate bedroom with a queen-sized bed that shares the private bath with bunk room guests. Great Room – Comfortable family gathering area in the main level Great Room. Large wood-burning fireplace and open cathedral ceilings to second floor loft area. Master Suite/Master Bath – The Master King Suite on the main level and the Master Bath feature a garden tub, double sink, private toilet chamber, and double faucets in the shower for romantic retreats. 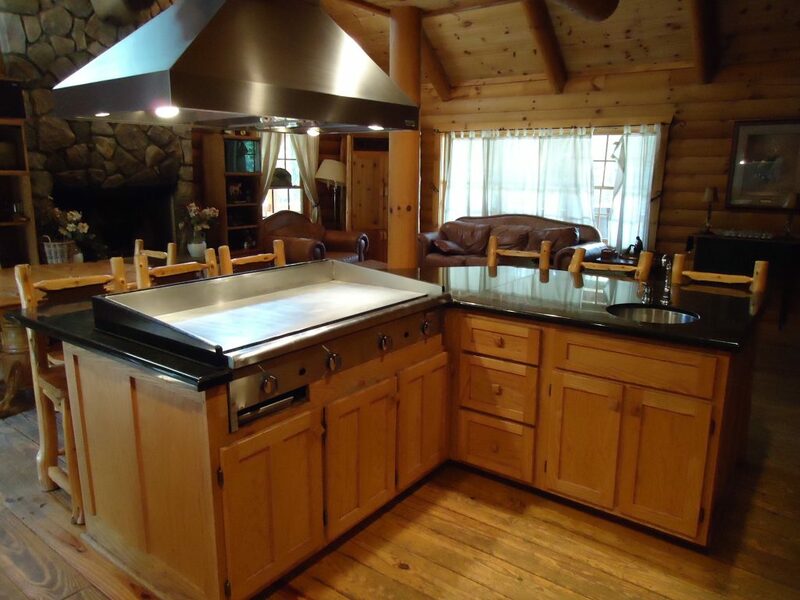 Kitchen – The kitchen is fully equipped for holiday cooking, family retreats, and group outings. Refrigerator, freezer, double oven, Japanese grill, gas range, microwave, and outdoor grill. The large 36” Japanese-style grill is ideal for cooking steaks, pancakes and burgers. Outdoor BBQ grill, also. The kitchen has a double oven with convection settings. The kitchen also includes a coffee maker, blender, tables settings, pots, and pans. Fireplaces – The Grand Lodge at Elk Ridge Ranch has 3 fireplaces to help keep you cozy and warm during your retreat or hunting adventure. The one on the lower level is gas. The other 2 fireplaces are wood burning. Loft – The second floor loft overlooks the Great Room and includes a sofa and a queen-sized bed. 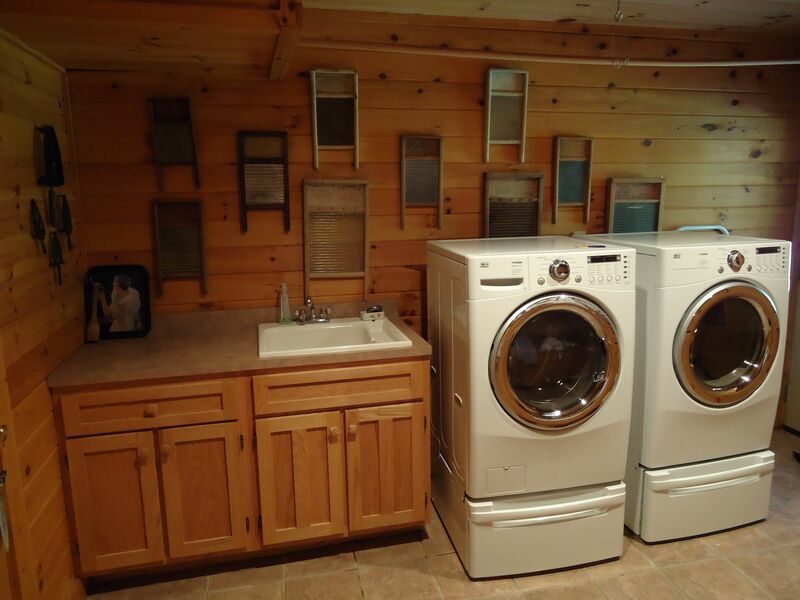 Laundry Room – The laundry room is located on the lower level, next to the bunk room and includes a modern, large-sized washing and drying machine. 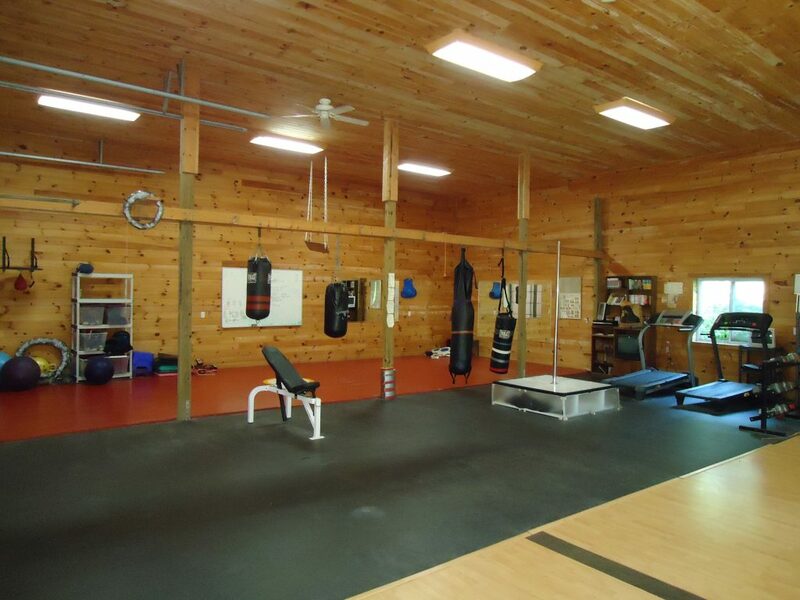 Gym and Recreation Room – The Grand Lodge has it’s own separate 40×40 separate outbuilding gym and recreation room with exclusive access to the Grand Lodge guests. The gym features a 20 x 20 dojo martial arts mat, a ping pong table, free weights and a mirrored studio area for dance or yoga. Includes 3 fitness poles.